How can I use subcalendars? Less Annoying CRM’s calendar now allows you to create different color-coded subcalendars. You can categorize your tasks and events into different subcalendars; you can keep some subcalendars private and others public; and you can sync each individual subcalendar with a corresponding subcalendar on Google. This post will cover the basics of how subcalendars can be used, but don’t hesitate to reach out to our support team if you have more ideas or questions! If you are on a multi-user account: an important thing to keep in mind before we start discussing subcalendars is that only you can see your subcalendars. 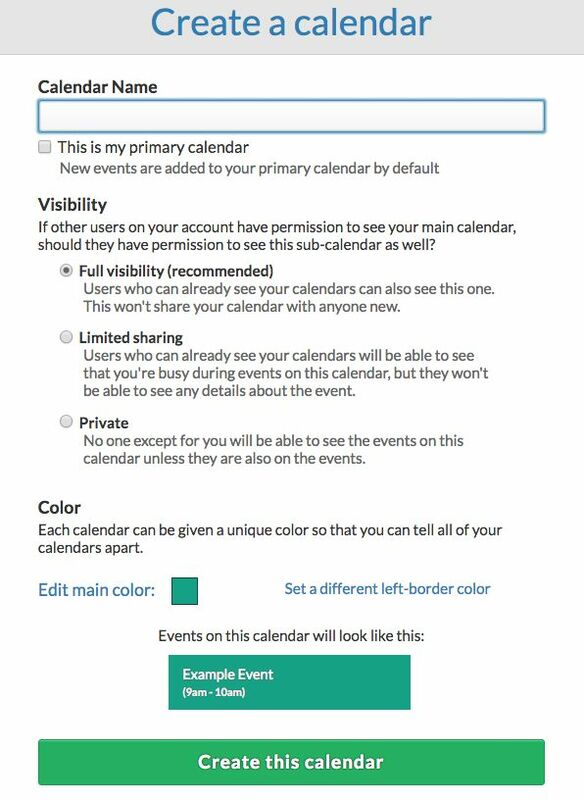 Even if someone has full access to your calendar and all of your subcalendars are public, they will see your entire calendar in their account as a single color. When they assign you a new task or event, it will automatically be public and placed on your primary calendar, unless you move it to another subcalendar. 1. Before you get started, think of how you want to divide your calendars. If you’re stuck, check out our ideas below; some common subcalendar choices are to have a personal calendar and a work calendar, a private and a public calendar, or calendars that categorize different types of events and tasks. What should my calendar be called? Name your subcalendar something simple, and something that makes sense to you. No one else on your account will see what your subcalendar is called. Who should see my calendar? If you don’t want anyone to see your events/tasks, make the calendar private. If you want people to know when you are busy, but not be able to view this subcalendar, mark it as limited sharing. Finally, if you want your team members to be able to see your calendar, it should have full visibility. Which colors should I pick? This is the most fun part! I chose my favorite colors for my subcalendars, but you’ll just want to make sure that your subcalendar colors won’t get confused with other colors on the calendar. 4. Save your calendar! You can edit this subcalendar at any time from your Calendar or the Calendar Settings page. From now on, you’ll have the option to add events and tasks to different subcalendars. Now that you know how to create subcalendars, let’s talk about how you might use them to organize your events and tasks. If you’re on a multi-user account, this is one of the simplest setups you could have with subcalendars. One subcalendar would be public, another would show you as “busy” but give no more details about the event, and the third would be completely private. With this setup, you could add events and tasks to each subcalendar, depending on how you want other users to see your calendar. By keeping your work and personal calendars separate, you can easily toggle your calendar to view events and tasks in one category, or both. On multi-user accounts, your work calendar can be public, and your personal calendar can be private. Our CEO Tyler King has a subcalendar just for reminders where he has all-day recurring events for things like paying rent, watering his plants, and deadlines for paperwork or taxes. Tyler uses a separate reminders calendar to hide the reminders from his main view (he doesn’t need to see them all the time), but the reminders are included in his daily agenda email so he still remembers them. I run some of our content marketing initiatives at LACRM, and I have a subcalendar for marketing related tasks and another just for our publishing schedule. Both calendars are private because no one else on my team needs to see them, but it makes it easier for me to quickly see all the marketing to-dos I have for the week, or toggle to the month view and easily schedule out all of our content and webinars. You can use subcalendars to organize not just your events, but your tasks as well. For example, if you want to organize your tasks by priority, you can have three subcalendars for low, medium, and high priority. When you create or edit your tasks, you can add them to a specific subcalendar to organize your tasks. You can also toggle your calendar view in LACRM to concentrate specifically on a certain task priority. Want more ideas for how to organize your tasks with subcalendars? Check out this post!